Catalan President Artur Mas has pledged to go ahead with the region’s independence vote, defying the Spanish Prime Minister in person. 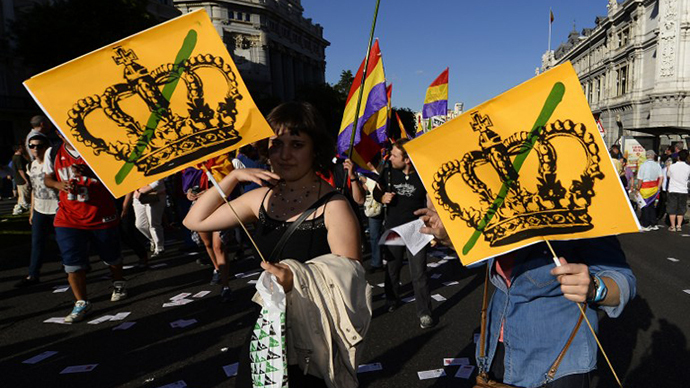 Madrid has branded the referendum as “illegal” and resolved to block the Catalan bid to separate from Spain. 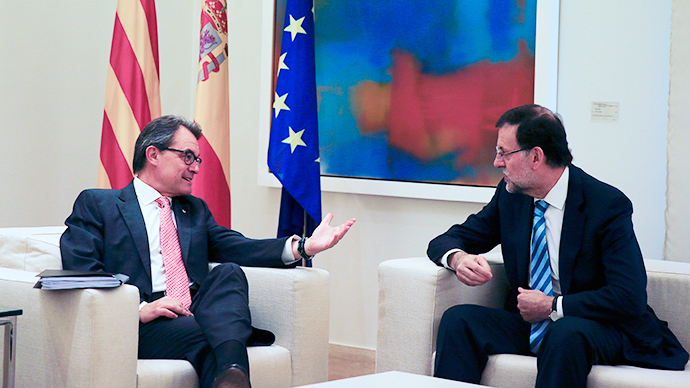 Mas met with Spanish Prime Minister Mariano Rajoy on Wednesday in their first encounter in over a year. The thorny issue of Catalan independence was high on the agenda and provoked strong statements from both politicians. Both parties reiterated their position on the vote which is scheduled for November, but made no headway in breaking the political deadlock. Mas said it was impossible to hold a legal consultation because Rajoy refused to budge on his stance the Catalan vote is a violation of Spanish sovereignty and therefore illegal. “I thought that Rajoy was going to propose something concrete. I came prepared to listen, but there was no proposal,” said Mas, adding that he believed Madrid’s stance was more to do with politics than the actual legality of the independence vote. “If we agree to hold a consultation then we will find a way to do it legally,” said Mas. Rajoy has been unmoving in his dialogue over the Catalan vote from the very beginning, and has resolved to block the referendum. Alicia Sanchez-Camacho, president of Rajoy's party in Catalonia, said the vote would be a violation of Spanish law. The Catalan independence movement has grown from strength to strength over the last few years, gathering momentum on the back drop of the EU financial crisis. The autonomous region of Catalonia has a population of 7.5 million and makes up almost a quarter of Spain’s GDP. 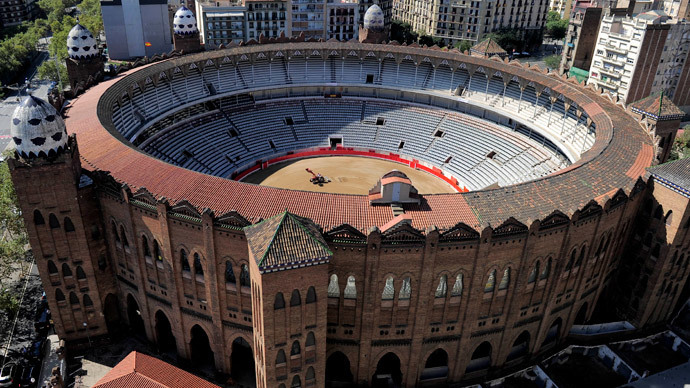 There has been growing resentment in the region that their taxes are being redistributing to other parts of the country and 45 percent of Catalans believe the region would be better off on its own, according to an April poll. Catalonia is not the only region of Spain campaigning for independence. The long-rebellious Basque country has also called for a referendum to decide on their future in Spain. In late May, Basque lawmakers adopted a declaration of self-determination to follow on the footsteps of Catalonia. 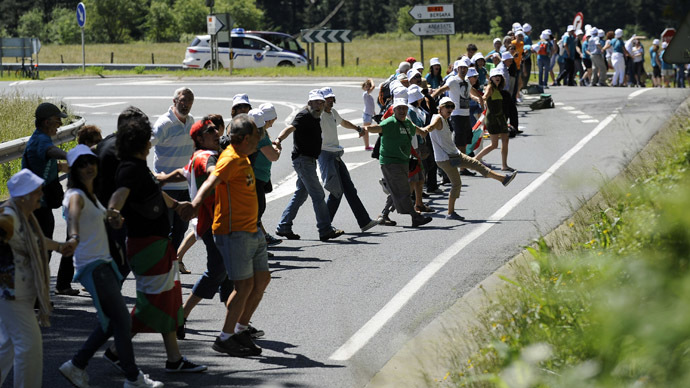 Last month, at least 100,000 Basque citizens formed a human chain measuring 123 kilometers in solidarity with the Basque independence movement.